Rocco's best selling light from anywhere is now available in a stunning bright red light. Amaze your audience with the original and the best with this bonus pack - perfect for the beginner, including a pair of D'Lites and the D'Lite DII "How to" DVD all in one package at a great price. Your purchase includes the D'Lite in regular size, suitable for adults. The D'Lite Bonus pack was developed for the beginner, as well as anyone that wants to take their D'Lite magic to the next level. Learn from D'Lite inventor Roger Mayfarth how to utilise your D'Lites and handle them most effectively. 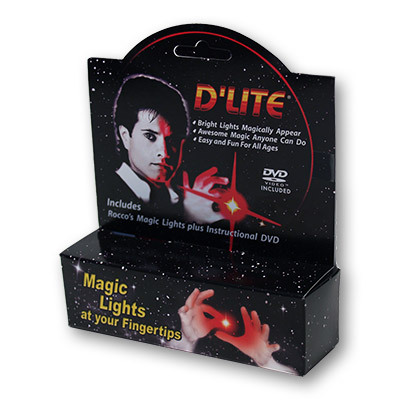 You will learn magic effects with one D'Lite, two D'Lites or with many friends all using D'Lite. You will see tons of great ideas on how to incorporate your D'Lite magic into anything you do. Amazing and endless routines available as you watch professional magicians use D'Lites combined with classic magic. Please note: also available in junior size.